Festivals reflect the cultural diversity of India, a land of many religions. Festivity denotes – new clothes, rangoli/muggulu, mango leaves thoranam, smell of camphor and incense sticks, family get togethers, fun, laughter and most importantly home cooks diligently prepare traditional sweets, savories and elaborate festive meals. Today being Dasara, it has to be a sweet related post. 🙂 Its all about mithais (sweets) which are uncompromisingly rich and it doesn’t matter how many calories they contain. Rava Laddu (Sweet Semolina Balls) and Semiya Payasam (Vermicelli Kheer) are South Indian traditional festival sweets that are absolutely mouth-watering and addictive. 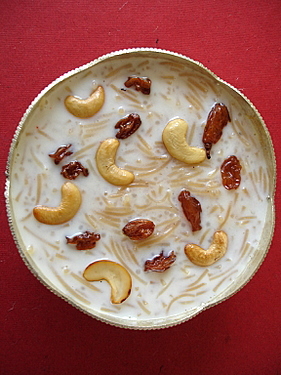 Semiya Payasam is prepared with Indian vermicelli that is roasted in ghee to a golden color, slowly simmered in milk and sugar, flavored with aromatic cardamom and garnished with toasted cashewnuts and raisins. Simple to prepare, quick, comforting and delicious with a heavenly aroma! Kitchen Notes – You will find that once you turn off the flame and the payasam sits, the semiya will absorb the milk and the payasam will thicken. The payasam thickens even when refrigerated. So at the time of serving, add some warm milk (a few tbsps) and combine well and serve. For a rich taste, use whole milk. 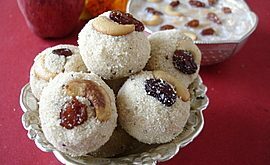 Rava Laddu is a melt-in-the-mouth delicacy prepared with sooji aka semolina, sugar, cardamom and garnished with cashewnuts and raisins. 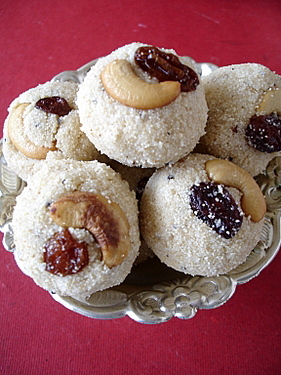 There are a number of versions of rava laddu recipe and each version has its own unique flavor. One variation is the use of grated coconut which I avoided. 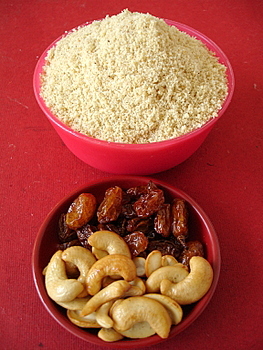 Very simple to prepare – roast semolina in ghee to a light brown color, combine sugar, cardamom powder, sprinkle milk and form laddus/balls out of the crumbly sooji-milk mixture and top with toasted cashewnuts and raisins. 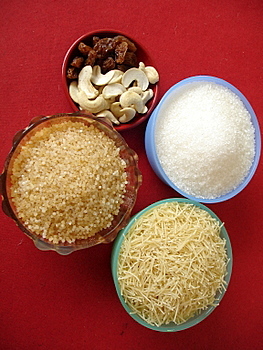 Kitchen Notes – For variation, add a few tbsps of grated coconut (roasted in ghee). If you add coconut the shelf life is shorter. 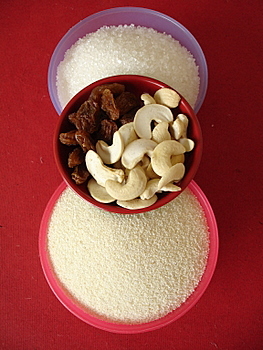 For a longer shelf life, its better to make thin sugar syrup and combine the roasted sooji in it and then prepare balls. 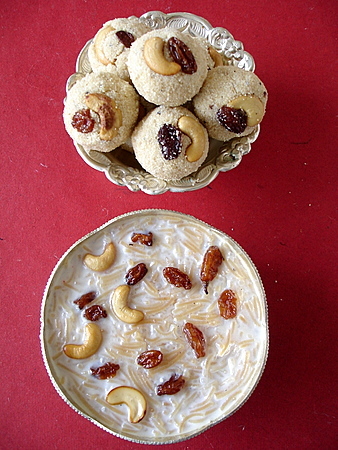 Both Rava Laddu and Semiya Payasam are my entries for Sugar High Friday food event hosted by Anita of Dessert First. She chose ‘Spices’ as the theme and with aromatic cardamom being the flavor enhancer in both the recipes, they make apt entries. Srivalli is hosting JFI – Festival Treats this month and both these treats are my entries for this event too. Today is the culmination of Devi Navaratri celebrations. Wishing all my readers, visitors and friends a happy Dasara! Heat a pan, add a tbsp of ghee and toast the cashewnuts and raisins till golden brown. Remove from pan, keep aside. In the same pan, add the sooji and roast it for approx 7-8 mts till a nice aroma emanates the kitchen and it turns a light brown shade. Remove from pan and keep aside. Take a vessel, add sugar, cardamom pwd, roasted sooji and remaining ghee and combine well. Sprinkle few tbsps of milk and mix till it forms a crumbly mixture. 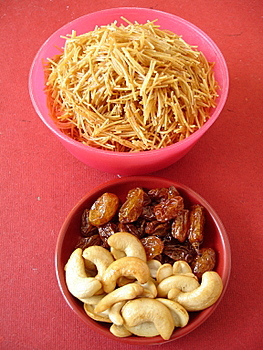 Using both your hands, form small ladoos and top with a roasted cashewnut and raisin. While shaping the laddos be careful such that the mixture stays together. Initially the laddu might tend to break hence be gentle and place the laddu carefully on a plate and it will harden in a few minutes. Thank you for the wonderful recipes! As a protocol within the family I prepared Semiya Payasam too. But, as usual the pictures on your post look so vibrant. I’m from Calcutta and as all of us know, Dasara or Durga Puja as it is more popularly known as, is a huge affair. Sindhur khela marks the farewell to the Goddess today and the entire navaratras are a delectable fare of fine Bengali cuisine. Let me wish you and your family a Very Happy Dasara and a Shubho Bijoya !! Sailaja, Our Sheer Korma, a traditional dessert/meetha that we prepare on Eid-ul-Fitr is also quite similar to your Semiya Payasam. I guess they are just different names for the same dish. I love to munch on Rava Laddus too. Its been a along time since I had some. They look delectable. Happy Dashera to you Sailaja. Both the recipes look mouth watering and tempting. Easy to make also. Navarathri wishes to you Sailaja. Rawa ladoo and payasam look too tempting and tasty. Happy vijayadasami to u and to ur family. payasam and ravaladdu looks awesome both r my favourti. 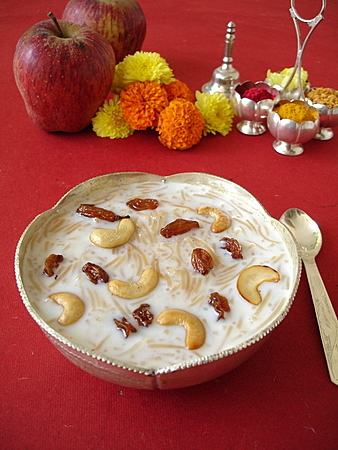 happy dussera sailu…..i too made semia payasam….but i cheated with condensed milk!! Dusshera subhakankshalu to you and your family. Those desserts look too good. Even I cook them at home similarly. you made my day and reminded me of home. Thanks for the recipes. By the way I see a few of your recipe photos in telugu-recipes.blogspot.com. Just wondering if someone has stolen your content. ooh, ooh, tempting laddus and payasam. Beautiful pics as usual. But one picture in the 3rd set of photos is not displaying. Check it. Happy Dasara to you and your family Sailu! I have become a fan of all your breathtaking recipes. Hats off. Happy Dussehra to you & family…! Great pics of Payasam and Rava Ladoo…! So nice presentation and lovely recipe of Ladoo. 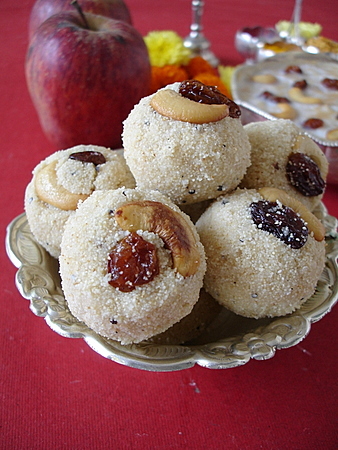 I think now I am going to make this rava laddu :). tomorrow is saturday n first thing I will do after lunch is to make this rava laddu. looking very tempting and texture is really attractive. Sailu…wow..these both recipes n pics r marvellous..bookmarked. Thks for directions too! HAPPY DASSERA to you n ur near ones! to be honest i have never liked ravaladdu. But after seeing the pictures you have posted makes me really want to give it a try……its absolutely mouthwatering. OH yum! can i come over? rava laddoo is one of my favs.Happy diwali to u.
Don’t think I can get the ingredients but that’s some beautiful food! Its helping me learn different varieties …. Hi Shailu, im new to the cooking blogs, your pictures are amazing and so authentic and good that cant take off my eyes from it. Hats of to ur creativity and such good receips too. Im north indian but love south indian food, your receips are so simple and home made. I have not yet started perparing as my mom is the queen of kitchen but after seeing your receips even i want to start cooking and specially all south indian food items. will definately try atleast on weekends and let you know the feedback. hello,iam lavanya i like your recepies. but small request,i want more varities of nillava pickles and sweets of traditional. Love your payasam and ladoo… but i love those silver kinnam a lot… they look so beautiful the way you have presented.. Ever since i have visited this site, i have started to loveee… cooking. They are exactly the way how my ammama cooks, you have such a wonderful collection and the pictures are equally amazing, i cant stop myself from visiting this site atlease once a day. My husband and my son are really happy these days to eat what i cook 🙂 I mean it!!!! !